One of the best-selling cookbooks of all time, updated for a new generation of home cooks. Few books have stood the test of time like the "Betty Crocker Cookbook"; none have kept up as well with the times and how people cook today. 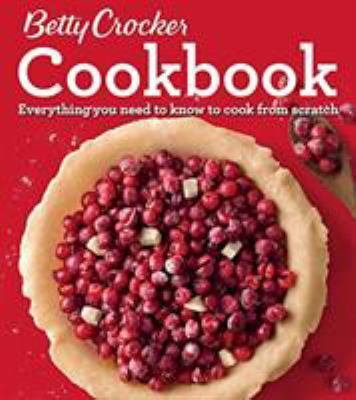 Classic meets contemporary in the 12th edition, with 1,500 recipes, all from scratch, over one-third new, and more than 1,000 photos.This one-stop resource bursts with kitchen information and guidance as only Betty Crocker can deliver. Learn to make a lattice crust, master a braise, can pickles, and even debone a fish via hundreds of how-to photos. Discover new ingredients organized by region, such as Middle Eastern or Indian, in vibrant ID photos. New and expanded chapters on one-dish meals, beverages, DIY foods, whole grains, and vegetarian cooking reflect what today s budding cooks want to eat, as do recipes such as Baba Ganoush, Short Rib Ragu, Pho, Korean Fried Chicken, Cold-Brew Iced Coffee, Cauliflower Steaks, Smoked Beef Brisket, Quinoa Thumbprint Cookies, and Doughnuts. And complete nutrition is included with every recipe." New (45 available) BRAND NEW. Over 1.5 million happy customers. 100% money-back guarantee. Make your purchase count: support Better World Books' worldwide literacy partners.